441 pages | 100 B/W Illus. Assistive technology has made it feasible for individuals with a wide range of impairments to engage in many activities, such as education and employment, in ways not previously possible. The key factor is to create consumer-driven technologies that solve the problems by addressing the needs of persons with visual impairments. Assistive Technology for Blindness and Low Vision explores a broad range of technologies that are improving the lives of these individuals. Presenting the current state of the art, this book emphasizes what can be learned from past successful products, as well as what exciting new solutions the future holds. Written by world-class leaders in their field, the chapters cover the physiological bases of vision loss and the fundamentals of orientation, mobility, and information access for blind and low vision individuals. They discuss technology for multiple applications (mobility, wayfinding, information access, education, work, entertainment), including both established technology and cutting-edge research. The book also examines computer and digital media access and the scientific basis for the theory and practice of sensory substitution. 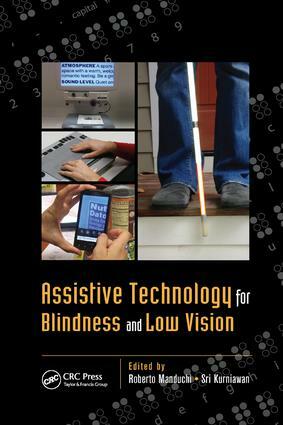 This volume provides a holistic view of the elements to consider when designing assistive technology for persons with visual impairment, keeping in mind the need for a user-driven approach to successfully design products that are easy to use, well priced, and fill a specific need. Written for a broad audience, this book provides a comprehensive overview and in-depth descriptions of current technology for designers, engineers, practitioners, rehabilitation professionals, and all readers interested in the challenges and promises of creating successful assistive technology. Roberto Manduchi, Ph.D., is a professor of computer engineering at the University of California, Santa Cruz. Before joining UC Santa Cruz in 2001, he worked at Apple Computer, Inc., and at the NASA Jet Propulsion Laboratory, where he conducted research on computer vision for autonomous navigation. His current research interest is in the application of computer vision and sensor processing to assistive technology for people with visual impairment. Sri Kurniawan, Ph.D., is an associate professor of computer engineering, a faculty member of the Center for Games and Playable Media, and an affiliated faculty of the Digital Arts and New Media at the University of California, Santa Cruz. Her research focuses on human-centered fun and enjoyable interactive systems for health and healthy living. Her current projects include formatting and layout sociotechnical solution for blind authors.